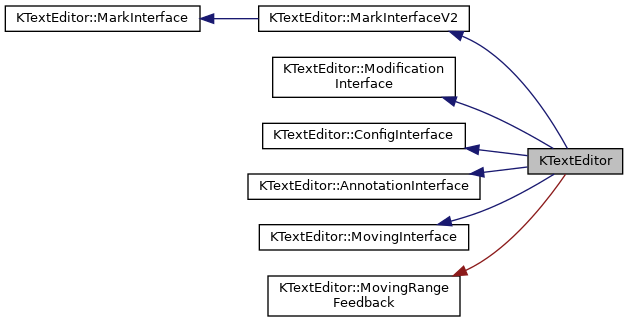 Backend of KTextEditor::Document related public KTextEditor interfaces. This file is private API and not part of the public KTextEditor interfaces. Definition at line 80 of file katedocument.h. The following lists all valid default styles that are used for the syntax highlighting files in the itemData's defStyleNum attribute. Not all default styles are used by a syntax highlighting file. Default for normal text and source code. Used for function definitions and function calls. Used for variables, if applicable. Used for control flow highlighting, e.g., if, then, else, return, continue. Used for operators such as +, -, *, / and :: etc. Used for built-in language classes and functions. Used for extensions, such as Qt or boost. Used for attributes of a function, e.g. Used for a single character. Used for an escaped character. Used for verbatim strings such as HERE docs. Used for special strings such as regular expressions or LaTeX math mode. Used for includes, imports and modules. Used for data types such as int, char, float etc. Used for numbers with base other than 10. Used for floating point numbers. Used for comments that reflect API documentation. Used for annotations in comments, e.g. @param in Doxygen or JavaDoc. Used to refer to variables in a comment, e.g. after @param in Doxygen or JavaDoc. Used for region markers, typically defined by BEGIN/END. the keyword @note in Doxygen. the keyword @warning in Doxygen. Used for comment specials TODO and WARNING in comments. Used for attributes that do not match any of the other default styles. Used to indicate wrong syntax. Definition at line 40 of file attribute.h. Search flags for use with searchText. Modifies the behavior of searchText. By default it is searched for a case-sensitive plaintext pattern, without processing of escape sequences, with "whole words" off, in forward direction, within a non-block-mode text range. Treats the pattern as a regular expression. Ignores cases, e.g. "a" matches "A". Plaintext mode: Processes escape sequences. Plaintext mode: Whole words only, e.g. not "amp" in "example". Definition at line 58 of file document.h. This signal is emitted before the cursors/ranges/revisions of a document are destroyed as the document is deleted. This signal is emitted before the ranges of a document are invalidated and the revisions are deleted as the document is cleared (for example on load/reload). While this signal is emitted, still the old document content is around before the clear. Set that the BOM marker is forced via the tool menu. Get access to buffer of this document. Is needed to create cursors and ranges for example. Definition at line 1073 of file katedocument.h. Returns a git compatible sha1 checksum of this document on disk. Removes all the elements in m_editingStack of the respective document. Definition at line 1140 of file katedocument.h. Get a list of all available keys. Get a value for the key. The first OffsetList is from decoded to encoded, and the second OffsetList from encoded to decoded. Reloads the current document from disk if possible. Get, which marks can be toggled by the user. The returned value is a mark mask containing all editable marks combined with a logical OR. Definition at line 234 of file katedocument.h. Insert a string at the given line. Add a string in the given line/column. Emitted each time text from nextLine was upwrapped onto line. Emitted when text from line was wrapped at position pos onto line nextLine. This is necessary if static word warp is enabled, because we have to know whether to insert a new line or add the wrapped words to the following line. Remove a string in the given line/column. Enclose editor actions with editStart() and editEnd() to group them. If removeLine is true, we force to join the lines. If removeLine is true, length is ignored (eg not needed). If newLine is true, ignore the textline's flag KateTextLine::flagAutoWrapped and force a new line. Whether a new line was needed/added you can grab with newLineAdded. Find the next modified/saved line, starting at startLine. If down is true, the search is performed downwards, otherwise upwards. Returns true if the click on the mark should not be further processed. Returns true if the context-menu event should not further be processed. index in the highlight list for which to find the section name. Definition at line 947 of file katedocument.h. Unwrap a range of lines. Same as plainKateTextLine(), except that it is made sure the line is highlighted. Returns the next or previous position cursor in this document from the stack depending on the argument passed. Definition at line 793 of file katedocument.h. Last revision the buffer got successful saved. Lock a revision, this will keep it around until released again. Get all marks set on the line. Get the mark's description to text. mark mark type. If the pixmap does not exist the resulting is null (check with QPixmap::isNull()). Get a hash holding all marks in the document. The hash key for a mark is its line. Tries to detect mime-type based on file name and content of buffer. the name of the mimetype for the document. index index in the highlight list for which to find the section name. Indicate this file is modified on disk. reason the reason we are emitting the signal. Create a new moving cursor for this document. Create a new moving range for this document. Highlighting of returned line might be out-dated, which may be sufficient for pure text manipulation functions, like search/replace. If you require highlighting to be up to date, call ensureHighlighted prior to this method. The range is now empty (ie. the start and end cursors are the same). If the range has invalidateIfEmpty set, this will never be emitted, but instead rangeInvalid is triggered. You may delete the range inside this method, but don't alter the range here (for example by using setRange). range pointer to the range which generated the notification. The range is now invalid (ie. the start and end cursors are invalid). You may delete the range inside this method, but don't alter the range here (for example by using setRange). Definition at line 1082 of file katedocument.h. removes the view from the list of views. The view is not deleted. That's your job. Or, easier, just delete the view in the first place. It will remove itself. TODO: this could be converted to a private slot connected to the view's destroyed() signal. It is not currently called anywhere except from the KTextEditor::ViewPrivate destructor. Saves the editing positions into the stack. If the consecutive editings happens in the same line, then remove the previous and add the new one with updated column no. Sets a new AnnotationModel for this document to provide annotation information for each line. Set a the key's value to value. Control, whether the editor should show a warning dialog whenever a file was modified on disk. If on is true the editor will show warning dialogs. Set the variable name to value. Setting and changing a variable has immediate effect on the Document. For instance, setting the variable indent-mode to cstyle will immediately cause the Document to load the C Style indenter. Ask the user what to do, if the file has been modified on disk. The document emits this signal whenever text was inserted. The insertion occurred at range.start(), and new text now occupies up to range.end(). The document emits this signal whenever range was removed, i.e. Handling uppercase, lowercase and capitalize for the view. If there is a selection, that is transformed, otherwise for uppercase or lowercase the character right of the cursor is transformed, for capitalize the word under the cursor is transformed. Transform a cursor from one revision to an other. Transform a range from one revision to an other. Type chars in a view. Will filter out non-printable chars from the realChars array before inserting. User did set encoding for next reload => enforce it! Definition at line 1090 of file katedocument.h. Returns the value for the variable name. If the Document does not have a variable called name, an empty QString() is returned. The widget defined by this part, set by setWidget(). Wrap lines touched by the selection with respect of existing paragraphs. To do so will the paragraph prior to the wrap joined as one single line which cause an almost perfect wrapped paragraph as long as there are no unneeded spaces exist or some formatting like this comment block. Without any selection the current line is wrapped. Empty lines around each paragraph are untouched. See readSessionConfig() for more details.